CHATOGRAPH™ is excited to bring former NFL QB and ASU legend Jake “the Snake” Plummer to the team. The Pro Bowl quarterback played 10 seasons in the NFL with the Arizona Cardinals and Denver Broncos. With his ability to will his teammates to victory, Jake lead his teams to improbable playoff victories including the ’98 upset of the Cowboys. In his career, #16 threw for almost 30,000 yards and over 160 TDs. Before becoming a fan favorite in the NFL, Jake lead Arizona State University to a Rose Bowl berth in 1997. Named an All-American and Heisman finalist, Plummer became a Sun Devil legend with a 19-0 upset of then #1 Nebraska. Playing alongside American hero Pat Tillman in both college and the NFL, Plummer continues to support the Pat Tillman Foundation and portions of his CHATOGRAPH™ proceeds will go to support the foundation. For more info on there Pat Tillman Foundation, please check out the CHATOGRAPH™ charity page. 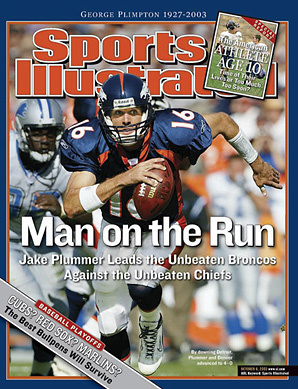 Jake Plummer is currently an NFL game analyst on Sports USA’s Sunday Doubleheader package as well as a college football analyst on the Pac-12 Network. Follow Jake on Twitter at @SnakesTakes and get ready to chat live with the legend. WELCOME BACK LOS ANGELES RAMS!